Street trees are the most important element of the street environment. They should always be included in the design of complete streets. Appropriate tree species selection and location and design of the planting site ensure the healthy growth and longevity of trees, enhances streetscape character, and maximizes the City and property owner’s investment. The San Francisco Department of Public Works (DPW) permits street trees in San Francisco (new tree and removal of existing tree). Tree Planting Permits, process, general requirements, and tree planting guidelines can be found on DPW’s website Additional design guidelines are found below. If your project includes additional street improvements, see Permit Process for more information. If you are making changes to your property, you may be required to install street trees. See Developer Requirements. Street trees are typically planted in tree basins (sidewalk cut outs) in sidewalks. Where planting strips of sufficient width occur between sidewalks and streets, it is not necessary to create independent tree basins for trees. Ground-cover landscaping should be included in planting basins larger than standard size. In limited circumstances, trees may also be planted in above ground planters. When adding trees to an existing streetscape, movable site furnishings should be relocated to allow for street tree planting in an appropriate spacing. If unmovable sidewalk elements interfere with a planting sequence, site the tree a few feet in either direction to accommodate obstacles. When designing a new or renovating an existing street, locate or relocate utilities and other elements where feasible to attain regular tree spacing. Consistent plantings, flowering species, and accent trees add aesthetic value. Accent trees, distinguished by their contrasting color, texture, or size, may be used to alert motorists to approaching intersections or mark the entrances of city parks and plazas. On formal streets with sufficient width, allées – a double row of trees – should be used to create a distinctive design. Impacts and constraints created by local climate. See DPW’s Approved Street Tree List (PDF) for a list of approved trees for planting in San Francisco. DPW must approve tree species prior to planting. The city may be divided into three climatic zones: Coastal (Fog Belt), Transition, and Bay (Sun Belt). The Coastal Zone is characterized by cool temperatures, dense summer fog, and prevailing westerly winds. This zone is best divided into a coastline and interior zone due to differences in wind exposure and salt laden air; consideration should also be given to the orientation of streets, as east-west running streets generally experience more wind exposure. The Transition Zone has cool to moderate temperatures, light fog, sunny skies, and diminished wind velocities. The Bay Zone supports warm temperatures, skies that are dry, clear, and sunny, and generally light winds. General characteristics of trees best adapted to the Coastal Zone include trees of lower stature (up to 25 feet tall), evergreen species, and trees that are wind tolerant. Trees for the transition zone need some wind resistance, should be of medium stature (25 to 50 feet tall), and may be either deciduous or evergreen. The Bay Zone provides an environment more suited to a wider variety of trees. 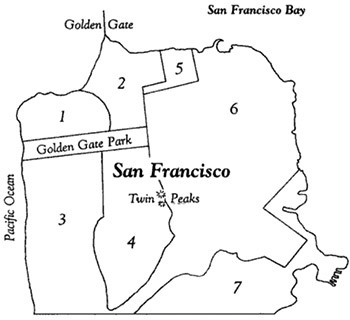 Trees that may be used include those of taller stature (over 50 feet tall) and those not noted for wind resistance, unless planted at higher elevation sites within the Bay Zone, which are subject to higher velocity winds (e.g., portions of Bernal Heights, Nob Hill, and Telegraph Hill). Caliper (trunk diameter) of trees to be planted should be a minimum of 2 inches at 8 feet of height (exceptions should be considered for desired species that may not attain this caliper size as a 24-inch box specimen). Minimum tree size at planting is a 24-inch box; 15-inch box specimens and smaller caliper sizes should be allowed for volunteer efforts and property owner initiated replacement. Tree branches that extend into the path of travel must maintain 80 inches of vertical clearance. Tree spacing should create a continuous canopy and buffering effect between the roadway and the sidewalk. Closer spacing is desirable on heavily traveled streets to create a palisade view looking down the sidewalk. Tree basins should be aligned so that the edges abutting the path of travel form a straight line along the block. Trees in Medians: Tress may be planted in medians 4 feet or wider, including curbs. Trees planted in medians should have arching canopy structures that provide visibility without excessive pruning, or be upright and columnar in form. Tree species selected for planting on median strips that are 4 to 6 feet wide should be expected to grow to trunk diameters no greater than 12 inches. On median strips greater than 6 feet wide, trees obtaining larger diameters may be used. Coordination with street lighting: Street lighting should be coordinated with tree selection, placement, and pruning, so that tree canopies do not sit directly below street lighting, per Overall Streetscape Guidelines. Or, pedestrian-scale lighting consistent with the approved SFPUC street lighting catalog that sits below the tree canopy could be used. For new streets where lights and trees are being placed, street lights should be generally placed halfway in between trees. When trees are being added to an existing streetscape, the basin pattern should respond to the location of existing lighting. Similarly, when new street lights are being added to an existing streetscape, they should be placed as far away from existing tree canopies as possible. Trees and building projections: The width of the fire escape balcony, projected down to the sidewalk, should remain clear of any trees or landscaping. Awnings, canopies, signs, and marquees may also present conflicts with street trees. New building projections should not compromise tree health or potential tree planting locations. Trees need adequate surface area for root growth. Most tree species have the majority of their roots in the first 18 inches of soil. An important variable in tree basin design is the amount of surface area. Greater surface area provides for greater entry of water and oxygen into the soil. Tree basins should meet the following the minimum size shown in the figure below. Basins may be square, rectangular, or have other shapes to meet the minimum size requirements. Linear planters may enable a design to achieve optimal tree basin size on narrow sidewalks. Permeable surfacing increases access of tree roots to water and oxygen when the optimal tree basin size is not possible. Continuous trenching between tree basins (which can be covered by paving) should be used wherever possible to maintain the capacity of oxygen and water to enter the soil in a tree basin, particularly where minimum sized tree basins must be employed. Tree basin size should vary with the mature size of the tree species and soil conditions. Larger basins should be provided for larger trees where space permits. Landscaping with drought tolerant groundcovers, non-woody shrubs, or grasses is encouraged within the tree basin, for trees older than 5 years, and as long as it is well maintained. Open soil in tree basins is discouraged. When landscaping is not used, the open basin area surrounding the base of the tree should be filled with sand set paving stones, cobbles or compacted decomposed granite (DG) to maintain a level surface. Sand set paving stones or cobbles: Where sand set paving stones or cobbles are used, they should generally be placed outside the root ball. Decomposed granite (DG): To account for settling of soil and DG, additional DG may need to be added during scheduled maintenance. Tree Grates: Tree grates and other structural basin covers are generally discouraged, as over time, they can become an obstacle or tripping hazard and can interfere with the diameter growth of trees, resulting in girdling and damage to trees. Maintenance of tree grates is costly, often requiring workers to expand the diameter of the opening as the girth of the trunk increases. In limited locations, such as heavily traveled sidewalks where sidewalk width limits pedestrian movement at peak times, where a formal design treatment is desired, such as along ceremonial streets, or in bus zones, it may be necessary or desired to install tree grates to provide an adequate walking surface or design treatment. Grates should be designed with easily removable inner rings to allow for the growth of the tree trunk. In limited circumstances such as extremely narrow sidewalks, tree grates may be counted toward the minimum clear path of travel; however, as they are difficult to maintain to an accessible standard, this is not a preferred solution. Grates should have less than 1/2 inch spacing between rings to provide a safer walking surface and to prevent material from being trapped or falling into the basin. Maintenance of grates used in high pedestrian traffic areas should include the periodic cleaning of grates and adjustment to eliminate any tripping hazard. Tree guards: Tree guards are generally discouraged, but may be appropriate on heavily traveled sidewalks for the protection of newly planted trees. They are also appropriate adjacent to heavily used bus and light rail stops, around school buildings, and adjacent to other land uses with associated activities that may be considered detrimental to tree health and safety. Tree guards should be of an attractive design, not possess any sharp edges, and be made of durable material. Tree guards should be a minimum of 18 inches wide to provide sufficient distance from the tree trunk at the time of planting. Tree guards are an opportunity to provide a special design and to incorporate artistic elements. Edging and planting guards: Tree basins may be edged with low planting guards, using appropriate clearances per Sidewalk Landscaping guidelines. Edging treatments are appropriate for residential and commercial neighborhoods with moderate to low pedestrian traffic. Where used, the base of the guards must be a solid 4 inches to allow for cane detection. Edging should not prevent water from moving off of the sidewalk and into the tree basin, and should be designed to allow rainwater from the sidewalk (in all cases) and/or the street (if specifically designed to do so) to flow into the planted area. Openings in the edge treatment can allow for water to pass through. Where the base of landscaping is not at grade with the surrounding sidewalk, such as on sloped streets where planting is terraced and in stormwater infiltration planting areas, a 4 to 6 inch raised edging treatment should be installed around the landscaped area to delineate the presence of landscaping and grade change to people with visual impairments. Responsibility to maintain street trees varies depending on the street. Most street trees in San Francisco are maintained by fronting property owners. There are, however, more than 35,000 street trees that are currently being maintained by the city. In order to sustain a healthy Urban Forest, the Department of Public Works (DPW) is proposing to standardize maintenance responsibility such that, in general, fronting property owners will be responsible for the maintenance of street trees in the public right of way. DPW does not have the resources to prune and maintain trees at a frequency recommended by the tree care industry to sustain their health. Careful attention to tree maintenance is especially important during the first few years after planning to ensure that the tree is properly established. DPW publishes several documents to assist property owners maintaining healthy trees.